The Gemco Series 956 BLOK Housing was designed for applications where mounting a standalone Rod or Profile style Linear Displacement Transducer (LDT), also known as a linear position sensor, is prohibitive. The 956 BLOK is an optional Rod and Barrel style housing for the 955 BRIK Series of linear position sensors. This housing adds a chamber, magnet and piston. The streamlined anodized aluminum extrusion houses the sensing element and electronics. The piston assembly moves over the sensing element that determines the position and converts it to a readable output. The 956 BLOK is a self-contained unit and does not have a can or head assembly. All of the electronics are incorporated in the position sensor which is less than 1.5 inches square. Units can be ordered in span lengths up to 36 inches long in 0.1 inch increments. The 956 BLOK is designed for applications where economical continuous feedback is necessary. The sensor can be a cost effective replacement to limit and proximity sensors and linear potentiometers. Applications include presses, blow molding, injection molding, extrusion, roll positioning, wicket gates and many more. 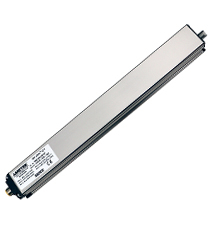 • Sensor Length up to 36"